Sad at the way Ashwatthama, the son of Drona was killed, Yudhishtira undertook penance here and worshipped the Lord after taking bath in Tiruchittraru and under took renovation (Jeernodhdharam) work of the temple and attained mental peace. Natives call this temple as Dharamputra Pratishta. Chenganur is a station on the Ernakulam - Tiruvanandapuram line. Can be approached by road from Kottakarai station(48 kms) on way to Kottayam. Theertham - Sanga Theertham, Thiruchiraaru (river). Board a bus from Kottarakara Railway Station(en route Trivandrum). 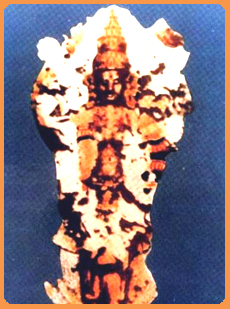 The Moolavar of this sthalam is Imayavarappan. He is found in Nindra Thirukkolam facing his thirumugham towards west direction. The perumal is prathyaksham for Rudran (Lord Shivan). This divya desam is situated 6 kms East to Thiruvaaranvilai, 4kms west to Thirupuliyoor, 5 kms North west to Thiruvanvandoor and 10 kms North to Thiruvalvaazh. We can reach this sthalam also by getting down in a small station through the Railway lane between Thiruvanandhapuram to Ernakulam via kollam. Bus facilities are also available. So, if we come to this divya desam, from here its easy to visit othr divya desam, since they are close to each other.